Heat things up tonight with this zesty, savory pasta favorite. It’s so good, you’ll want to save some for work tomorrow! 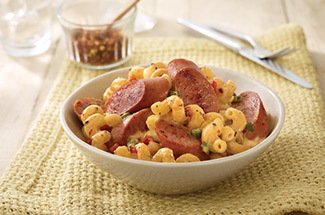 Heat up dinnertime with this spicy pasta dish featuring our delicious 4 Pepper Smoked Sausage and roasted veggies. 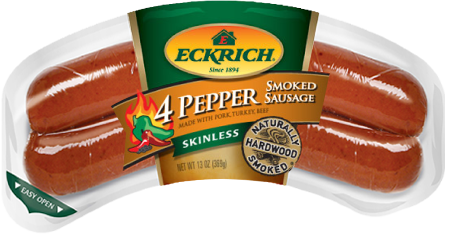 Slice smoked sausage diagonally into 1/2-inch pieces. Dice green and red peppers. Heat oil in skillet over medium heat. Add peppers and smoked sausage and cook until browned. Add peppers and smoked sausage to cooked pasta in a large bowl. Pour cheese sauce over pasta and mix together.